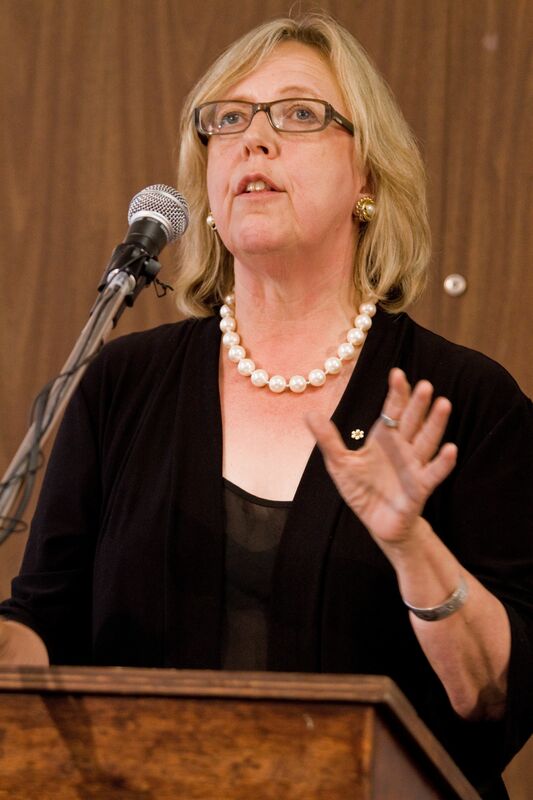 Elizabeth May, leader of the federal Green party and lifetime environmental activist, was on campus earlier this month. She was a panelist at ‘The Afterparty: A Discussion on the Future of Parliamentary Democracy in Canada’ and a guest speaker at the Stand Up for Science rally. The Dal law school graduate sat down with her alma mater’s student paper to talk politics, the environment and students in our democracy. The interview was conducted on Sept. 16, after the rally for science press conference. Dalhousie Gazette (DG): How have politics been mucking up the environment? Elizabeth May: Under Stephen Harper there has been an unprecedented attack on the regulations, laws, and policy that are the tools to protect Environment Canada. Stephen Harper is the first prime minister we’ve had who has shown a visceral antipathy for anything to do with the environment. He is tearing apart our ability to know what is happening in the environment, to do anything about it, to monitor it, and certainly he’s plowed through anything that could stand in the way of expanded oil sands, tankers, pipelines, drilling, or fracking. He’s got a very pro-fossil fuels agenda. DG: What would you say is the first step to correcting this? EM: It’s critical that Canadians become fully informed of how much damage Stephen Harper has done because otherwise I don’t think we can correct it. I’m not going to say anything negative about the Liberal, NDP or any other federal political party but even the Conservatives without Stephen Harper would be a better bunch. But the problem is the national media isn’t covering the dismantling of institutions within the government of Canada, the dismantling of institutions such as the functioning of parliament, the proper budget exercises, evidence based decision making across many policy areas. As long as Canadians don’t know about this, the next person who occupies the prime minister’s office is not going to walk through those doors and think ‘I have too much power, I had better give my power back to the individual members of parliament’. The only way that’s going to happen is if Canadians are fully informed and if it becomes an election issue that the Prime Ministers office has too much power. DG: How would you best recommend students get involved in the process? EM: If you’re interested in partisan politics and tend to support the Green Party or the NDP, join those parties. Try to influence their policies. Be engaged in things like campaigns or demonstrations that need a lot of bodies there holding up signs. If you’re busy studying for an exam and you don’t think you can help, make yourself go for just half an hour and hold up a sign. Make a commitment to make a difference and follow through on it. Another effective thing students can do is, write a letter to the editor of the Globe and Mail, just 300 words in a quick email. Do whatever you can to elevate the level of awareness of the rest of Canada as you delve into these issues in school. Write to the editors, of national papers, your hometown papers, your local papers, even your student papers. Otherwise, due to cutbacks at newspapers and the corporate control of a lot of our media, this news just isn’t getting out. DG: You’ve alluded to a problem; politicians think students are apathetic and that in turn makes them apathetic. How would you say is the best way to end this? EM: One thing I’ve noticed is that the most educated students who have the most sophisticated political analysis of what’s happening in the world tend to opt out of conventional democracy and politics. But, for some reason, they don’t think of getting involved with local politics or even running for office themselves, getting involved in election campaigns, making sure people getting elected to parliament also understand these issues. The tools to rescue democracy are there because we still live in a democracy. There’s a spectrum of young voters: some don’t vote because they’re so disgusted with the performance of some politicians, some don’t vote because they don’t think they know enough which is terrible because all you have to do is go to the websites and read the top 10 priorities of every party and figure out where you fit. It’s not hard to inform yourself nowadays with the web. And some are so sophisticated but have decided that the system isn’t salvageable. This system must be saved; it’s all we’ve got.